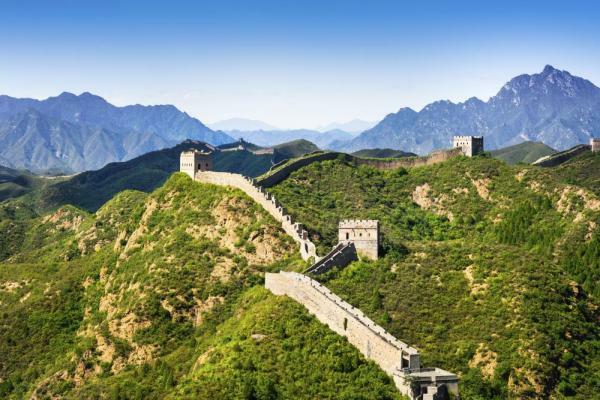 Explore the best of China on this classic China highlights tour in 10 days. 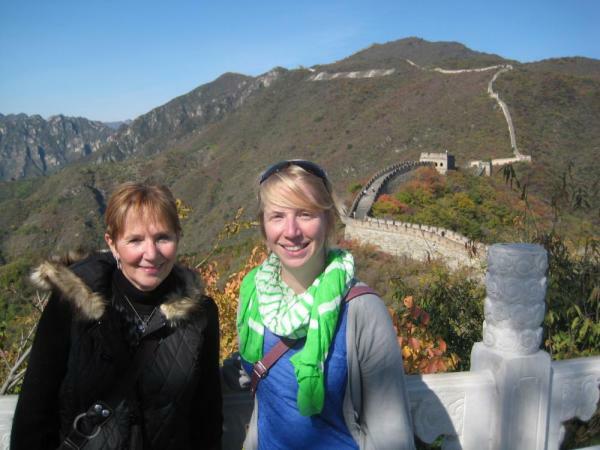 Visit Beijing and tour the Great Wall and Forbidden City. Continue on to Xi'an to see the Terracotta Warriors. 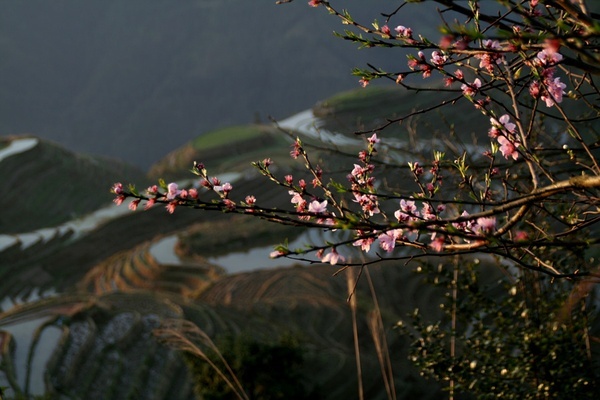 Next head further south to the cities of Guilin and Yangshuo, bordering the picturesque Li River, and explore the rural Longsheng Rice Terraces. 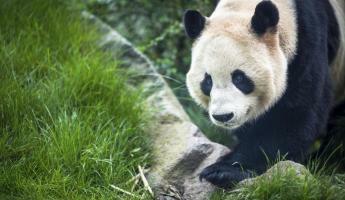 Enjoy our best China highlights trip. 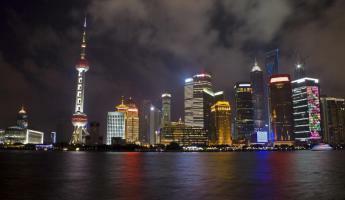 Arrive to Beijing where you are met by your Beijing guide and transfer to your hotel to check in. This morning visit the buildings and monuments of Tian'anmen Square, including Tian'anmen Tower, National Museum of China, Great Hall of the people, Chairman Mao Memorial Hall, and the monument to the People's Hero. Continue on to visit the magnificent Forbidden City. This World Heritage Site bears the legacy of housing the emperors of the Ming and Qing Dynasties starting in 1420. Enjoy lunch at a hidden Yunnan restaurant in a hutong near the Bell Tower before setting out on a rickshaw tour of the nearby hutongs, or ancient city neighborhoods. These alleyways have created the residential infrastructure in Beijing and date back multiple centuries. Chat with the locals here and get an up-close glimpse into their daily life and climb up the Drum Tower for panoramic views of the old city of Beijing. Enjoy a Cantonese dim sum dinner this evening. This morning drive 2 hours and take the cable car to the Mutianyu section of the Great Wall, a less touristy section than other locations. Hike around here for 1-2 hours exploring this 6th century section of the World Cultural Heritage Site which was restored during the Ming Dynasty. After lunch at a local restaurant, visit next the Summer Palace, a quiet royal retreat that epitomizes the philosophy and practice of Chinese garden design. Wander through the unique landscape design and palaces along Longevity Hill overlooking Kunming Lake. Enjoy dinner this evening at Dadong Roasted Duck Restaurant for the chance to try the renowned culinary delight, Peking duck. Next visit Olympic Park to see the two 2008 Olympics stadiums, the Bird's Nest and Water Cube, and their dazzling light display at night. This morning fly on to Xi'an, the ancient capital city for 13 dynasties and starting city of the Silk Road. Today you will visit the Shaanxi Museum, one of the largest state museum collections in China and boasting over 300,000 items including coins, metal objects, and other pieces of artwork. Next explore Giant Wild Goose Pagoda this afternoon. This 1,300 year old pagoda was built during the Tang Dynasty in honor of a famous Buddhist monk and offers an amazing view of Xi'an. Explore the surrounding courtyards, including the North Square, which holds the largest musical fountain in China and performs at set times of day. This morning drive 1.5 hours to the site of the Terracotta Warriors, which are considered one of the most significant archaeological excavations of the 20th century. First discovered in 1974 by farmers digging a well, the discovery eventually attracted archaeologists which led to the largest pottery figurine find in China's history. After lunch at a nearby restaurant, return to Xi'an for a walk along the ancient city wall, stopping for impressive views of the old city contained within its walls on one side and the modern city that lies without to the other side. Next wander the Muslim Quarter, known for its mosques, souvenir markets, and delicious food and visit the iconic Xi'an Bell Tower which marks the center of the ancient capital. Tonight enjoy a traditional Xi'an dumpling dinner, similar to Dim Sum. Try up to 18 different varieties of dumplings throughout the meal. 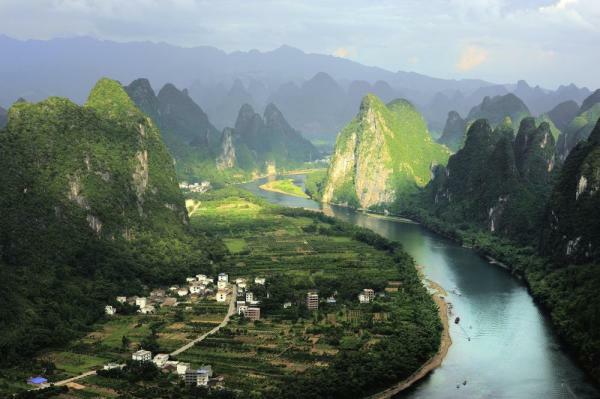 Fly this morning to Guilin, a city well-known for its karst topography landscapes located along the west bank of the Li River and bordering North Hunan. Upon arrival drive 40 minutes to Reed Flute Cave, a popular landmark and tourist attraction. This limestone cave is illuminated with multicolored artificial lighting and displays impressive stalactites and stalagmites and more than 70 ink inscriptions that date back as far as the Tang dynasty in the 8th century. Next see Solitary Beauty Peak, a lone spire that rises from the northern section of the city near the the mansion of Prince Jinjiang. This evening visit the Sun and Moon Twin Pagodas, which are designed and illuminated with multi-colored lights at night in such a way to make them appear as they are named, the Sun and Moon. 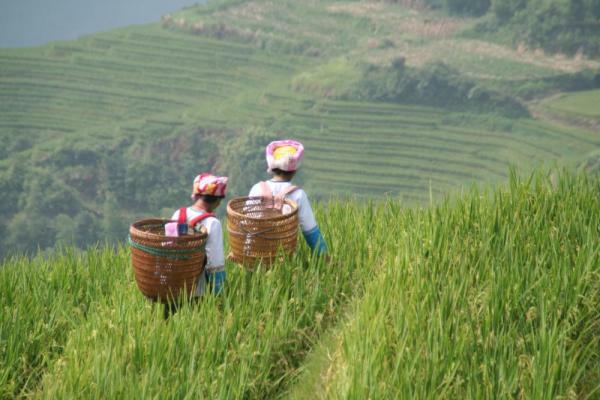 Today you set out for a two hour drive north to the Longji Rice Terraces entrance. Here board a shuttle for 45 minute to Ping'an Village. 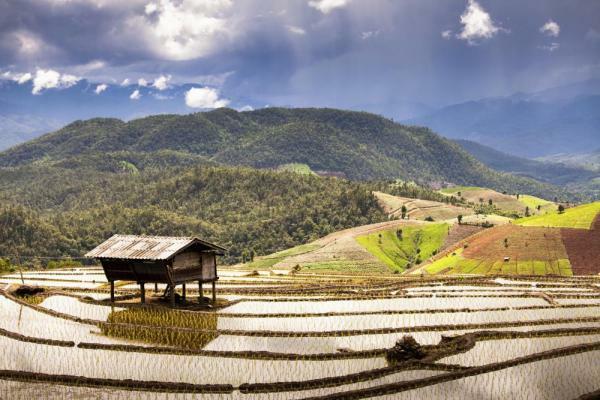 Hike a half hour uphill to the village where you meet the locals and can set out to explore the rice paddies carved into the surrounding hillsides. The minority group of Zhuang people here are the second largest of 56 recognized ethnic groups in China. Their rice terraces, built over 650 years ago, cover an area of over 16,000 acres and span an altitude between 980 ft and 3600 ft. Enjoy lunch in a small family owned restaurant. Return to Guilin this evening and enjoy dinner in an authentic restaurant. This morning take a shuttle 45 minutes to the Mopanshan Pier, where you board a two deck riverboat and cruise downstream to Yangshuo. 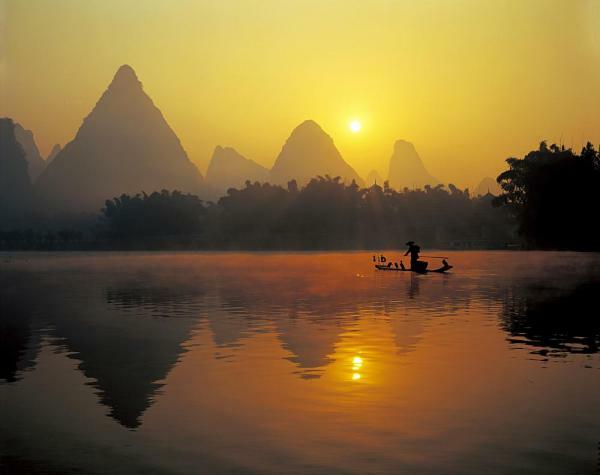 This picturesque river is one of the most popular tourist destinations in all of China. A light buffet lunch is served on board and after 3-4 hours you arrive in Yangshuo and walk to your vehicle to drop your luggage. Explore the area of Western Street, Yangshuo's oldest street with 1400 years of history from a variety of cultures, before continuing outside of town ten minutes to your hotel for the evening. Today set out to explore the natural arch, Moon Hill, a famous landmark in the region and popular hiking and rock climbing location. Climb to the base of the hill in 20 minutes for a view to the surrouding city and valley. Next explore nearby Fuli town, one of the best preserved ancient towns in Guilin and the renowned hometown for painted paper fans. Wander the fan-making workshop and see the local market in action and watch as locals sell vegetables, crops, herbs, meat, and live chickens and ducks. Return to Yangshuo this afternoon and enjoy more free time to wander the area. Drive the hour and a half back to Guilin to catch your flight on to a connecting city for your international flight home.